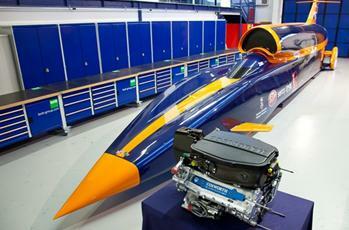 April 24, 2011 - Bloodhound SuperSonic Car (SSC) team has employed the HyperWorks suite of computer-aided engineering tools in the development of its jet and rocket powered car. The futuristic speed machine is designed to reach mach 1.4 (approximately 1,050 mph) in its pursuit of the world land speed record. While its chassis resembles an aircraft, the vehicle has wheels, suspension, steering and brakes, just like a normal race car. Aside from its jet and F1 engines, each component of the car is being custom designed, and Altair's OptiStruct software, the structural optimization technology of the HyperWorks CAE software suite, is playing a crucial role in that design process. The lean Bloodhound team, based in Bristol, England, relies on a range of technology to spark innovation, technology that includes OptiStruct, which was used for optimization of the rear chassis structure and to set up a wheel design using the least amount of material possible without compromising the wheels' ability to manage anticipated forces of 50,000 G's. The rear chassis was designed using a steel structure. They placed the jet engine over the rocket and reconfigured the rear chassis. The vehicle has undergone 10 design iterations; to ensure the aerodynamic shape is correct at sub, trans and supersonic speeds. The team used OptiStruct, to determine the most efficient use of material. The software includes capabilities for topology, shape and size optimization, enabling engineers to quickly determine the main load paths in multiple design envelopes early in the conceptual design phase. "We used Altair's OptiStruct to develop a steel structure, because the team wanted to get the best strength-to-weight ratio," said Chief Engineer Mark Chapman. "We built various models, putting in stringers and trusses. OptiStruct showed us where we needed to put the material. We ended up with an organic, geodesic shape ? one that we would not have thought of." "The key to success with this project is to undertake extensive computer modeling to increase understanding and reduce risk," added Project Director Richard Noble. "We need to prove our concepts by analysis and simulation before we enter the build phase of the Project." OptiStruct was also used to develop the wheels. Here the team's goal was to use the least amount of material while ensuring functionality. By using a design-of-experiments (DOE) methodology, engineers optimized the design to reduce the loads sufficiently to allow the wheels to be made of aluminum instead of the more expensive titanium. "OptiStruct showed us where to add and remove material from the parts," Chapman explained. "For us, it was invaluable in turning around designs. We saw the effects of our changes, and the software guided us in terms of adding or subtracting material. We used OptiStruct as a tool to show us the way to design the most efficient structures; we then turned these into manufacturable concepts." Much work still lies ahead for the Bloodhound engineering team. Detailed designs are soon to be finalized as the project enters the build phase. Hybrid rocket testing is scheduled to start in the UK later this summer. The actual car will then be ready for action in 2013. "I'm very proud that OptiStruct was used in such an outstanding project," said David Mason, managing director for Altair, UK. "Once more, OptiStruct is helping to drive innovation and to realize a project that seemed to be unthinkable only a few years ago. The team members' reliance on technology is enabling them to push the limit on several fronts. ?Their efforts are expected to yield advances in metallurgy, low-level aerodynamics, high-vibration telemetry and low-level jet and rocket operation. This project has no precedent, and everything the Bloodhound team does is innovative. I'm looking forward to seeing the first real-time tests and the final run for the world speed record at the Hakskeen Pan in 2013." The engineering community will capitalize on the technology and experience gained from this iconic engineering adventure to inspire students to pursue careers in science, technology, engineering and mathematics.